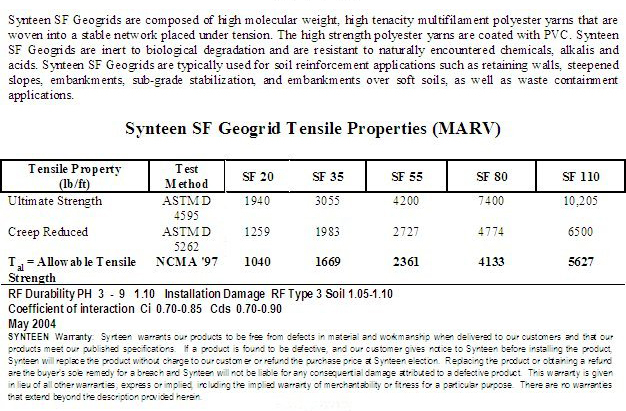 The SF Series Geogrid is composed of high-tenacity multifilament yarns of high molecular weight polyester that are woven into a stable network placed in tension. The high strength polyester yarns are coated with a PVC material. SF Geogrids are inert to biological degradation and are resistant to naturally encountered chemicals, alkalis and acids. SF Geogrids are typically used for soil reinforcement applications such as retaining walls, steepened slopes, embankments, sub-grade stabilization, embankments over soft soils, and waste containment applications. 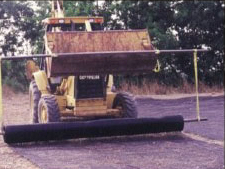 The flexibility in both manufacturing and product selection makes SF Geogrids "the next generation" of polyester soil enforcement grids. 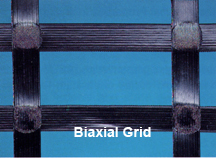 The standard geogrids product range, combined with STF's ability to manufacture specialty site specific geogrids allows the engineer flexibility in the design of soil reinforcement structures. 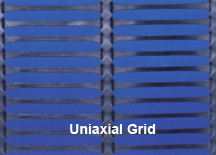 For example, SF Geogrids would aid in the design of a void bridging application where tensile strength requirements are high in both directions of the geogrid. Installation of SF Geogrid is quick and easy. Because of the product's light weight and flexibity, no special tools or equipment are required. Simply, lay out the geogrid, measure it to the required length, and cut it with a utility knife or scissors. When installed, SF Geogrid lays flat. It will not recoil, even in cold weather. SF 11 is composed of high molecular weight, high tenacity multifilament polyester yarns that are woven into a stable network placed under tension. The high strength polyester yarns are coated with a polymer coating. SF Geogrids are inert to biological degradation and are resistant to naturally encountered chemicals, alkalis and acids. SF 11 geogrid will reduce applied vertical pressure of heavy loads at depth of aggregate by spreading the load over a wider area. True in place strength after site damage testing based on TRI method of "installation" damage testing with coarse gravel (GP) and sandy gravel (SW).